Light up their life with incredible color and blooming beauty when you send this exquisite flower bouquet. Unforgettable peach roses are surrounded by red Peruvian lilies, pale yellow mini carnations, green hypericum berries, lily grass blades and lush greens to create a stunning flower arrangement. 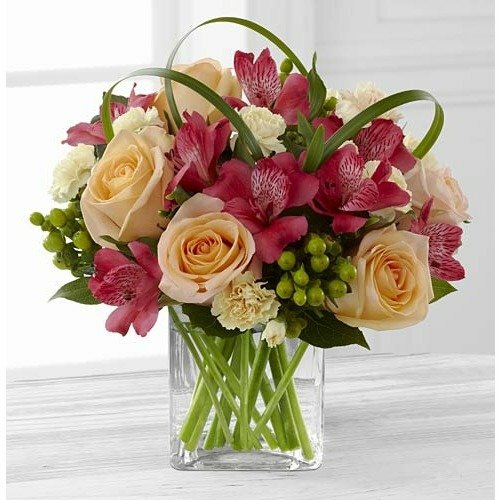 Presented in a clear glass cube vase to give it a sophisticated look, this mixed flower bouquet will express your sweetest thank you, get well or congratulations wishes.